Imagine having to run for your life because a van is crashing through the front of the store where you’re shopping and is headed directly toward you. This was the horrific situation that faced 71-year-old Maria Garcia, who was struck by the van and suffered devastating hip injuries and damage to nerves in her leg. The accident made her wheelchair dependent, restricted her ability to attend to her personal needs, and severely impacted her quality of life. Prior to this accident, Ms. Garcia had been thoroughly enjoying her golden years with her husband, frequently traveling and spending time with friends and relatives. After the accident, she spent almost all of her time confined to her home. The success of this claim depended on proving dangerous premises with normal use. As part of our initial investigation of the case, we hired a renowned safety expert from Georgia Tech University, who told us that the store (part of a national chain) should have installed bollards in front of the entrance in order to prevent this sort of accident. Bollards are cylindrical poles, 3-4 feet tall and filled with cement, designed to prevent vehicles from entering “pedestrian only” areas. It is well known that drivers sometimes lose control of their vehicles and crash into stores and other areas where people gather. The 2003 crash at the farmer’s market in Santa Monica, California is a famous example. 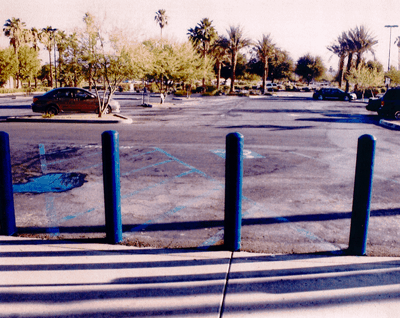 The key to this case was establishing that this store chain knew about the risk of this type of accident and knew about bollards and the safety benefits that they could provide. To get at that issue, we undertook an exhaustive effort to inspect over 100 stores owned by the defendant, located throughout California. Virtually our entire office staff was involved in this endeavor. What we learned was that many of the defendant’s stores had bollards. This proved that the defendant knew of the risk of vehicles entering their stores and knew how to prevent it. In deposition, we compelled one of the defendant’s employees to admit that they had a company policy to install bollards. Yet somehow, unfortunately, the store where Ms. Garcia shopped had been missed. We also proved that this location routinely allowed people to park in front of the store, in a poorly marked no-parking zone. This contributed to the danger, because if someone is parked in that zone and then accidently hits the accelerator while in drive, they would come crashing through the store before anyone would have time to get out of the way. This is exactly what happened when Ms. Garcia was injured. As a result of our efforts, the defendant chose to avoid the risk of a jury trial and settled for $800,000. This money will allow Ms. Garcia to get the medical and attendant care at home that she needs to regain some quality of life.